"Thank you very much!" "You're not welcome!" A24 has debuted the first official trailer for the outstanding indie film The Florida Project, the latest feature from Tangerine director Sean Baker. This premiered at the Cannes Film Festival this year to rave reviews - read mine here. The film tells the story of Halley, played by Bria Vinaite, and her daughter Moonee, played by Brooklynn Prince. They live at The Magic Castle, a motel in Orlando just in the backyard of Disneyland. Moonee and her friends run around causing all kinds of trouble and it's such a delight to watch them. Willem Dafoe also stars in one of his best performances of his career, and I really mean that. This film is really something special, and you can see why with this trailer - which captures the magic and charm of this beautiful film just perfectly. One of the year's best indie gems. 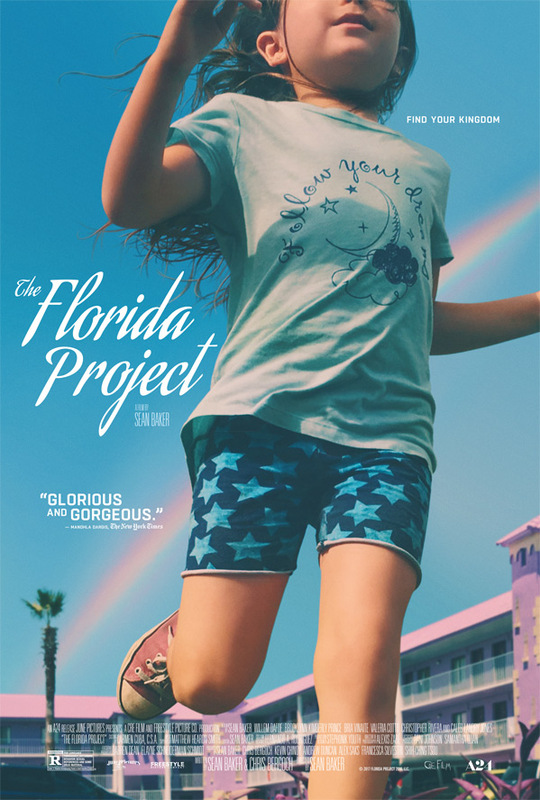 I wrote in my review that The Florida Project is "full of life and honest emotion, and can teach us plenty…"
The story of a precocious six-year-old and her ragtag group of friends whose summer break is filled with childhood wonder, possibility and a sense of adventure, while the adults around them struggle with hard times. The Florida Project is directed by acclaimed American, indie filmmaker Sean Baker, of the films Four Letter Words, Starlet, Prince of Broadway, Take Out, and Tangerine previously. (Follow him on Twitter @Lilfilm.) The screenplay is written by Sean Baker and Chris Bergoch. This first premiered at the Cannes Film Festival in the Directors' Fortnight sidebar (read our glowing review). A24 will release Sean Baker's The Florida Project in theaters starting on October 6th this fall. It's one of the best films this year.